Tools and supplies very organized and easy to see and access. Everything very organized in separate containers behind closed doors. Minimal visual clutter except for the items I found pretty and inspiring. Minimal Visual Clutter and Functional. Bright, Fun with Visual Abundance. Pretty, Inviting and Minimal Clutter. Visual systems that are really simple and easy. Hidden systems that are fast and easy to use. Detailed systems that are in file cabinets or behind closed doors. Very detailed organizing systems that are visual and easy to access. Put away out of sight, but fast and easy to find. Out where I won't forget them and easy to access. Visible and organized properly for quick access. Organized properly and put away. A Butterfly is a very visual person and likes to see all their belongings for fear of “Out of Sight, Out of Mind”. Unfortunately, it just isn’t feasible to leave all of our things out, all of the time. You are probably a Butterfly if you have clothing on top of your dresser and on the floor but your closet and drawers are practically empty. Butterflies are often overwhelmed with the idea of organizing and therefore put off starting big projects. A Butterfly must be careful not to overrun their home with clutter which steals their time, energy and can have a negative impact of those they love. Hooks, hooks and more hooks work well for butterflies. You also need to practice the ONE MINUTE RULE. If something takes less than ONE MINUTE to put away, do it right now. The word "later" should be removed from the butterflies vocabulary! Invest is some clear storage contains and label, label label! A Cricket is a really organized bug! Because they like detailed mirco-organizing solutions, they tend to pile until they can organize "properly". Crickets tend to be very logical and like things in a certain order. Once the perfect organizing system is set in place, the Cricket will have no problem following it. Unfortunately, there is usually never enough time to setup the perfect system for everything in our home! Crickets are often quite organized and maybe even a bit over organized. Perfection can sometimes be paralyzing. The best solution for a Cricket is to let go a little bit. Try “Macro-Organizing” your piles instead of “Micro-Organizing”. Good enough organizing today is better than perfect organizing tomorrow. You can always go back and tweak and perfect another day, but in the meantime, at least it is put away. Ladybugs are generally stressed out by surface clutter and like to keep their living space clean and clutter free. You know you’re a ladybug if your surfaces are clean and tidy but your junk drawer is overflowing and you would be really embarrassed if guest ever opened your closets. Without a good marco-organizing system in place, the small stuff can get shoved here, there and everywhere! Ladybugs need to work on setting up systems inside drawers and closets that are quick and easy to use. Try setting just 15 minutes a day to organize a small space in your home. Labeled, open bins are perfect inside closets and drawer dividers are a must for the ladybug. A Bee is a visual person who usually always has a project on the go! Bees like to keep their tools, papers and supplies out until they are finished the job. This can quickly turn into clutter. There are lots of different kinds of Bees, some have work projects which come with mounds of paperwork to deal with, others have many different hobbies which require mountains of supplies. Bees almost always come with a lot of stuff. Whether it be exercise equipment, scrapbooking supplies, photographs, art supplies, books, cooking and baking utensils, wood working materials, home improvement tools or any other supplies you use during your hobby, it can quickly take over your space. Bees loves to have their space very organized, but there are only so many hours in a day and only so much we can reasonably get done. Peg board organizers and lots of shelving is a must have for Bees. Project boxes are also a great solution for busy bees. Use a bankers box or tote to store everything you need for what you are working on now and store it out of sight when you are not using it. 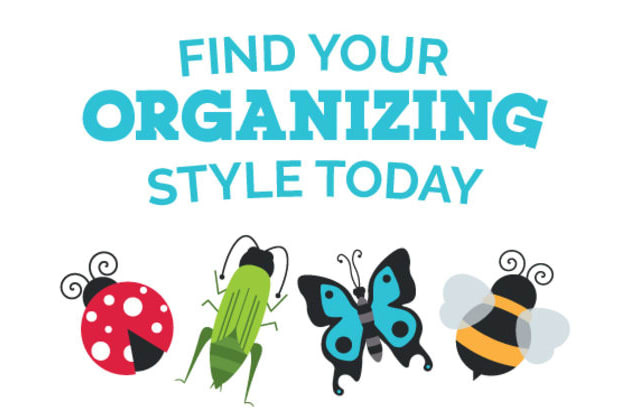 Learn the tips and tricks to get and stay organized for your unique organizing style.